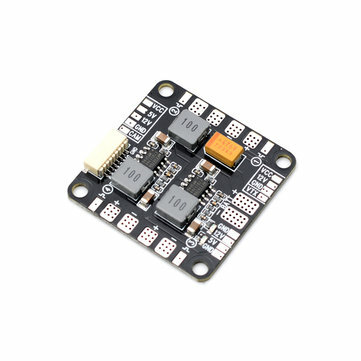 V8.3 Power HUB based on V7.3 changed the ESC solder tabs direction to make the ESC and battery solder pad be 90 degree, more suitable for X-type multirotor. The both-sides soldering way also suit H-type multirotor and no need to dismount the upper board, quite convenient to solder. 36X36mm size is easy to connect to flight controller. 4-layers PCB guarantees the 20A ESC’s steady working. 2 sets BEC circuit meanwhile can use servos, video transmitters, LEDs, moreover, V8.3 added the ESC signal channel, easy soldering and neat wiring. Support 3-6S (11.1V-22.2V). The HUB also features convenient solder bridge of various voltage for camera & video transmitter. The new LC filter circuit uses superior filter inductor and 47uf tantalum capacitor, 1A electrical load 5V ripple just only 31mV, 12V ripple just only 63mV, camera and video transmitter gain purer power source. ESC & Battery solder tabs in pairs. 5V & 12V Output LED indicators & Short circuit tolerant.